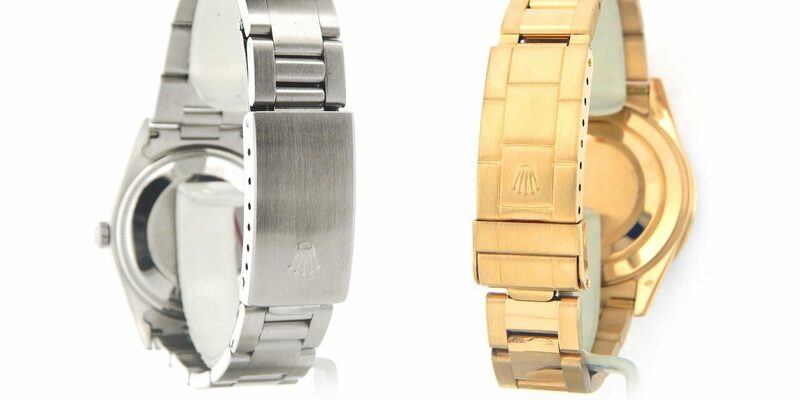 Rolex Oyster bracelets: hollow link or solid link? Throughout Rolex’s evolution there has been much emphasis on movement, case, dial, function, but not much focus on one of the watch most important elements –the bracelet. Early Rolex models utilized a customary vintage strap, but starting in 1947 Rolex created the Oyster strap making the watch look like with was strapped on with rigid parts. Moving to a stainless bracelet made sense as the water and dust proof Oyster case required a strap that too could survive the elements. Rolex’s first Oyster straps were riveted stainless links intertwined to look like a continuous steel strap. Each link was rectangle shaped and gradually tapered from 20mm wide at the watch head to 15mm at the clasp. 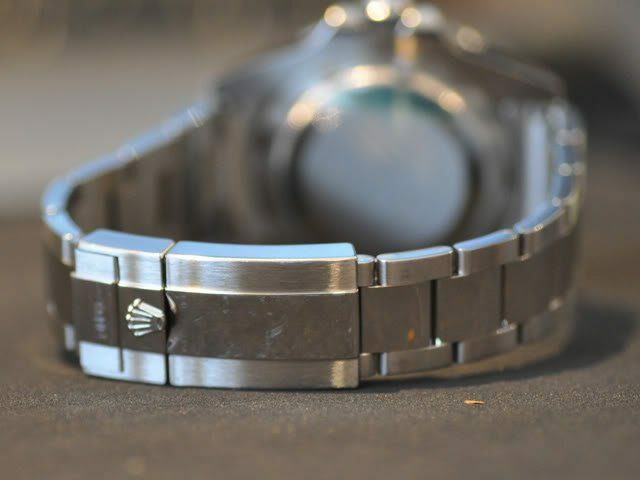 The original Oyster bracelet looked strong and rugged complimenting the water and dust proof watch head. The riveted bands did have problem with what is known as “bracelet stretch.” Bracelet stretch occurs when the links flatten out with use, and when the pins holding the links together elongate or wear smaller in diameter. Subsequently, many now vintage Rolex watches do not have the original strap as many time the original owner replaced the strap. During the 1960, Rolex introduced the Jubilee bracelet for the Rolex GMT models. The Jubilee bracelets utilized smaller links and with more pivot points the bracelets were seen as more comfortable. The center connecting section was highly polished and on two-tone models, was 14ct or 18ct gold. Like with the riveted Oyster bracelets, Jubilee bracelets do have an issue with “bracelet stretch” because of the increased pivot points and the hollow center links are prone to getting dirt and grit inside that wears the pins holding the links together. Despite this drawback, Jubilee bracelets are as popular today as they were in the 1960’s. In the early 1970’s Rolex moved away from the riveted Oyster link to the folded steel Oyster link thus removing the need for rivets. The folded link Oyster strap has solid ends on each link, and a folded center section that was hollow, like the center links on the Jubilee bracelet. The newer Oyster links were more durable, but still had the same problem of dirt and grit entering the hollow center link and contributing to link wear and stretch. The Oyster and Jubilee bands utilized a folded steel clasp that was held with tension from the clasp’s hinge. 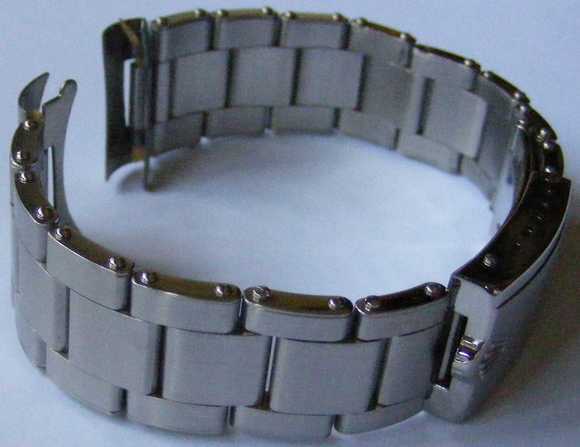 Starting in the early 2000’s, Rolex started moving to using solid center links on both the Jubilee and Oyster bracelets, solid end links that connect to the bracelet to the watch head, and updated clasps that utilized dedicated springs rather than hinge tension found in the older clasps. Solid bracelet links and end links now found in all modern Rolex watches make the bracelets feel more robust, heavier, and stronger. Solid end links are less prone to dirt and grit from getting into the pins holding the links together, and do not rattle like the older folded “tuna can” bracelets and clasps. Although there are some reports of the newer clasps breaking from inconsistent solder, by and large, the newer clasps are a huge improvement over the older clasps. Most newer clasps posses an Easy Link for quick expansion when the weather changes, their tension stays constant and does not require adjustment (aka bending the hinge to tighten the clasp) unlike the tuna can clasps, and they do not squeak and rattle. The SCUBA extension found in the Glidelock clasps of the Submariner and SeaDweller are pure feats of sound engineering, and are much more functional that their predecessors. Although the older Oyster and Jubilee bracelets do bring a nostalgic feel to a watch, there is no comparison to Rolex’s updated bracelets and clasps.